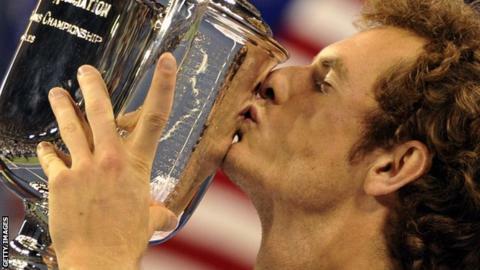 Andy Murray: Can he dominate tennis after US Open triumph? Monday's epic US Open final might have marked the end of Britain's 76-year wait for a male Grand Slam singles winner, but it could just be the start of things for Andy Murray. Murray has lived in the shadow of tennis's 'big three' throughout his career. Djokovic, Rafael Nadal and world number one Roger Federer have greedily hoarded the Grand Slam trophies for the last seven years, winning 29 of the 30 on offer before Monday. Cash and Wilander believe the top three will become a top four, with Murray leading the way. "Federer is 31 and this is the Indian summer of his career," Cash told BBC Sport. "We'll see more great tournaments and matches from him, as we did at Wimbledon. There just won't be as many as before. "Murray and Djokovic are closely matched, but Andy has just shown he can come out on top in a big final on Djokovic's best surface." Indeed Djokovic had won 27 straight matches in major hardcourt tournaments prior to his defeat at Flushing Meadows on Sunday. Murray - the new world number three - has clearly been second best to Nadal so far though, with the Spaniard boasting a 13-5 career record against the Briton, and having won six of their eight encounters in Grand Slams. Nadal's greatest adversary could be his own body, though. The 11-time Grand Slam winner missed this year's Olympics and US Open because of an ongoing tendinitis problem and is likely to miss more hard-court tournaments because of the impact the surface has on his knees. "Nadal is the really tough one for Andy, but he's having big problems with injury," Cash said. "His style of play puts pressure on his knees and he's missed a lot of tournaments." Wilander agrees. "Rafa is always a huge threat on clay and grass," the Swede said. "But he's not as big a threat on hard courts because of his health. That will really impact his ability to become number one again." Cash also says he cannot see any "bright young things" coming up to challenge tennis's new big four. HOW CAN HE IMPROVE EVEN MORE? Simply breaking that Grand Slam duck after four near-misses will give a huge boost to Murray, says Wilander. "We knew Andy was as good as anyone. The only thing holding him back was his mentality, that pressure of not having won a Slam," he said. "Victory will give him huge belief, confidence and make all the difference." Cash said: "In the fifth set against Djokovic, Murray was complaining that his legs felt like jelly. This was caused by fatigue but also nerves and pressure. Winning a first Grand Slam will certainly help that." The Australian has been impressed with Murray's more assertive tactics this year and argues he should become even more attacking. "Tactically, Andy has positioned himself in a more attacking position closer to the baseline," Cash said. "It means he can take the ball earlier and dictate the play more. In the past he would get in a negative frame of mind, standing further back and waiting for his opponent to make errors. "I'd like to see him go into the net more though, something he didn't do much against Djokovic. He's also a very good volleyer and this would add another dimension to his game." Ivan Lendl has received a lot of the credit for Murray's transition from also-ran to Grand Slam champion. Can he push him to greater triumphs? "Coaches are over-rated in many cases - and I say that as someone who coached Mark Philippoussis when he reached the final of the US Open and Davis Cup," said Cash, who beat Lendl in the 1987 Wimbledon final. "Ivan has played a key role, though. Before, Andy was struggling to find someone to look up to. Ivan is someone you listen to. He has given Andy confidence, calmness and the benefit of his experience." Like Murray, Lendl lost his first four major finals but went on to win eight Grand Slam titles and dominate the world number one spot for several years. "As a player, Ivan wasn't content just to win that first Grand Slam and he'll tell Andy that this is just the start of things," Cash said. "He also played in an era of great change - of racket technology, court surfaces, coaching and training - and was always at the cutting edge of things. "With Andy, he'll again be looking for the small improvements that, added together, can make a big difference to his game." Cash: "I think he will win half a dozen Grand Slams. I think he will certainly win the Australian Open and Wimbledon, possibly even next year. And he will be number one in the very near future." Wilander: "This is the perfect time for Murray to step into the winner's circle and push the other guys out of the way. I don't see any reason why he shouldn't win six, seven Grand Slam titles. He's clearly as good as the other three and can play so well on so many different surfaces."